Fantastic gardened terrace with wonderful views! 180 sqm. villa, 5 bedrooms (sleep 11 ), 3 bathrooms, 4 terraces, swimming pool. Beach & marina 1 minute walk. Gran Canaria enjoys the best weather in the world. Swim in the sea and sunbath in wintertime. Payments only through platform of Homeaway. I'm renting my house since 2008. Thanks to all my customers for they fantastic comments about the house. It is a pleasure for me to be specialised in housing a big families. Each year I try to improve the house and the comfort with grandparents and children. This is the perfect house for big families due to the bedrooms have very good distribution and the common areas invite to stay all together. Big spaces with fantastic views. Special for big families: it is adapted to elderly and children. The most safe pool for children. The best views. 3 bedrooms with terrace and wonderful view. Very big for quite and confort. This three story house was perfect for our family of ten- aged 3 to 68. We especially liked the layout, with both double and twin-rooms, including spacious bathrooms on all floors. The middle floor even has en extra bedroom with fold-out beds. There was plenty of room for socialising, indoors and outside. The kitchen and the rest of the house was well-equiped with everything we needed and more. Nice touch with a basket of fruits, bottle of wine and large glass of olives upon arrival- thank you so much! The surrounding area was just as expected with a pool nextdoor, a nice beach just down the street and a small Spar Supermarked nearby. If we missed anything it was a heated pool. The pool was great for cooling down, but to cold to stay in long, especially for the youngest kids. Hosts were very flexible regarding check-in and check-out times- thanks again. Thanks a lot for your fantastic review. I’m very happy to know that you felt so good at my house. I hope to see you another year. We are a large family of 8 adults and one baby and had a wonderful stay at this very comfortable and well equipped house. The 5 bedrooms are spread over 3 floors and there was plenty or seating areas for our group. The beach just 5 minutes walk away is very special as unlike most beaches on Gran Canaria it is not surrounded by villas, shops and the usual facilities. It seems to be exclusively for the use of the small group of properties that surround the marina, so no sunbeds available just a peaceful sandy beach ideal for swimming, The shared pool area is spacious and there are plenty of sunbeds and was again very quiet when we were there in February half term. There is one local spar shop just 5 minutes walk away that is as good as any large supermarket and the yacht club restaurant serves fantastic food which we enjoyed on two occasions. We also spent the last afternoon at the yacht club as we had time to kill before our flight. Although I would recommend hiring cars, most of our party spent the entire week very happily just enjoying relaxing in the Pasito Blanco complex. I would highly recommend this house if you are looking for a quiet spot to holiday in. Thanks a lot for your fantastic review! I hope to receive you another year. You are a fantastic group. Thanks for your care with the house. 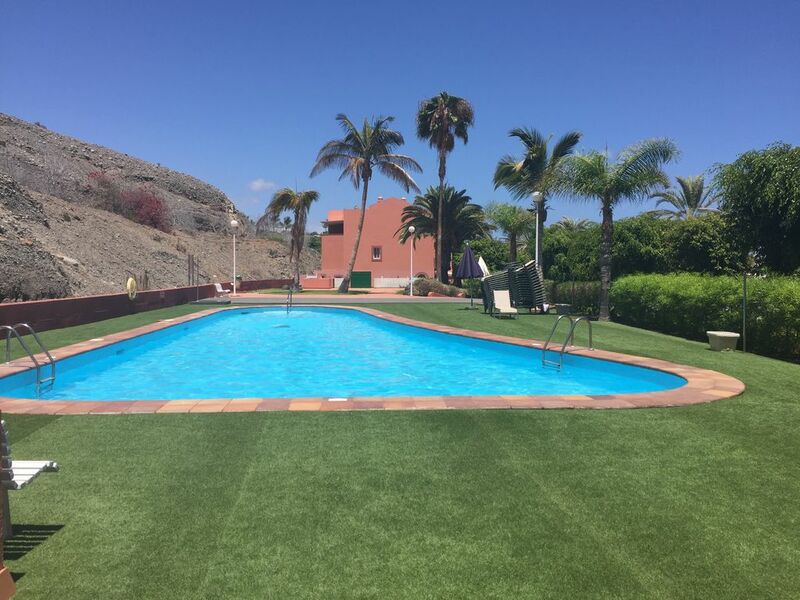 A great location for a family holiday with the adjacent pool and with a safe beach and a well stocked and sensibly priced Spar shop only a 5 minute walk away. Fresh bread baked daily. Yacht club bar and restaurant, 10 minutes walk away if you want to drink and eat out on site, but UK hotel prices for the drinks! For future readers it is helpful for those with young children to know the bedroom layout. Ground floor - a twin with no balcony. Showers on all 3 floors. Excellent wifi - faster than UK!! Thanks for your fantastic review and description! I”m pleased to know that you enjoyed your stay in my house. You were a fantastic group: the house was perfect at your departure. It is a pleasure to have guests like you. Was here last year. Would keep coming back as much as possible. Great house, great location. Great cycling, pool, beach. Excellent restaurants close by. I’m very happy with you and your group. The 2 times that you have been at my house, you gave me facilities for hour of cleaning due to I had arrival and departure in the same day. Quiet, private and well maintained place. Close to the beach. Good choice for group of people who plan sport activities. /cycling, golf, tenis, swimming/. We missed only volleyball court on the beach. This was our second stay here and we loved it just as much as the first time. This time we had my elderly parents with us and they also loved it. Maria was again very helpful, she put us in touch with a company where we could hire a wheelchair and was there to meet us even though we had a late flight. She had kindly got us in some basic provisions which we really appreciated. The villa was immaculate and had everything we needed and there was plenty of room for all of us. The pool and beautiful beach were perfect for a very relaxing, family holiday. We will definitely return. Thanks for your wonderful review. I'm very happy due to you have repeat your stay and you have been a fantastic customer. 3 golf courses within 4 kilometers. Within 3 kilometers you'll find shopping centres, amusement parks, hotels, casino, luxury shops, jeweleries, restaurants. You can walk to Maspalomas beach, the best gold sanded beach in the Canary Islands. Golf: Pasito Blanco is surrounded of 3 golf courses: one of them, Meloneras golf, it is just at the back of the urbanization. The second one is Maspalomas golf and the last one is Salobre golf. Pasito Blanco is the best place for golf players and for everyone who look for peace in a private urbanization but want to be near, a few minutes by car, of all the enjoyment of the island.